Man has always seemed to have a fascination with our closest neighbour. Little green Men from Mars have been a staple of Science Fiction (both literary and film) since, well, forever. My (and I suspect everyone’s) first experience with this phenomenon was H. G. Wells, The War of the Worlds (1898). Amazing guy…already plotting the destruction of life as we know it at the hands of our Martian neighbours, 71 years before Man landed on the moon. Since then, the idea of invasion from above has been a staple of written fiction and film. 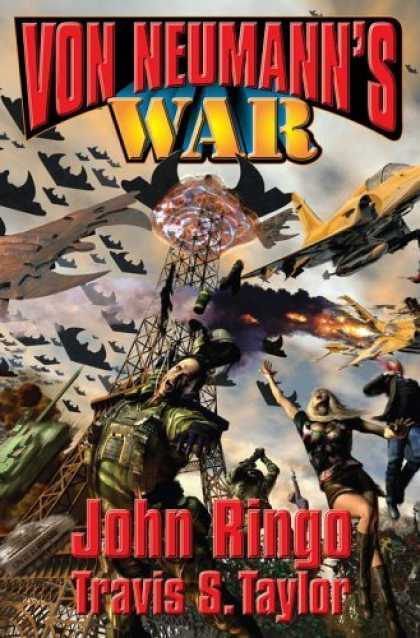 War of the Worlds was updated to modern times by Douglas Niles (War of the Worlds: New Millenium) and rewritten as an account from the eyes of H.G. Wells by Gabriel Mesta (The Martian War). In film, there was the classic War of the Worlds and the less than classic remake. Mars Attacks spoofed the idea and Harry Turtledove spun the idea on its head with man intruding on Mars (A World of Difference)…although he sets it in an alternate Universe and substitutes the fictional planet of Minerva for Mars. Now Travis S. Taylor and John Ringo have spun a worthy tale about invasion by our Celestial neighbours in Von Neumann’s War. A little background…in the near future, astronomers discover that the surface Albedo (how strongly an object reflects light from a light source such as the sun) of Mars is shifting from the familiar Red spectrum to something much more gray. Several probes on the planet, such as NASA’s Mars Exploration Rovers, have gone disconcertingly silent, raising alarms within both the defense and scientific community around the World. NASA is tasked with developing a new probe for a fly by in a ridiculously short period of time, but using off the shelf parts and a fair bit of ingenuity, they manage to get a mission underway…only to have it destroyed within seconds of reaching the outer atmosphere of Mars. Alarmed, both the Military and Scientific communities team up in efforts to prepare for what appears to be imminent (relatively speaking) invasion. Within months the same effect is observed on the Moon, and with a little help from the Hubble Telescope, the nature of the threat is determined. Von Neumann machines have come…and they are not friendly. These self replicating machines have been stripping the Solar System of any metal both to repair and replicate themselves, and it seems that Earth’s turn has come. Helicopters, jeeps, tanks, jet aircraft; none have any usefulness in combatting such a foe. So, what to do when you’re facing a nemesis light years (literally) beyond your technology who eats pretty much any weapon system you might throw at it? Well, the answer is…you get innovative pretty damn quick! That’s much of the fun of this novel…reading the inventive ways in which the protagonists combat an enemy which is essentially invulnerable to any weapon system mankind has created within the last century. The protagonists become creative with their weaponry…paint ball guns firing plastic explosives…ceramic bullets, aircraft, and engines…advanced laser technology…and frankly, once in awhile…a good old stick. So, is it a good book? Definitely. Yet there are a few flaws. The characters have a tendency to come up with the technology needed to combat the machines in an inordinately short period of time. Furthermore, the climax of the novel revolves around a “God in the Machine” moment, in which one character (whose back story is nicely ramped up during the course of the novel) finds that “fatal flaw” that delivers the “Hail Mary” moment that kind of irked me. It’s not even the solution that irks…but rather the swiftness with which the problem is solved. And finally, it could use a damn good glossary of terms. DARPA anyone? However, if you are a Sci-Fi junky looking for your next fix of planetary devastation…then this is the book for you.